Sylvia Arlene Collins, 94, of Junction City, passed away on January 24, 2019 at Valley View Senior Life in Junction City. Sylvia was born June 9, 1924 in Auburn, Maine to her parents Dorris M Palmer and George E Hodgkins. They both preceded her in death. Sylvia grew up in Old Orchard, Maine along with her one sister, Norma, who passed away at a young age. Sylvia loved to be around the ocean. 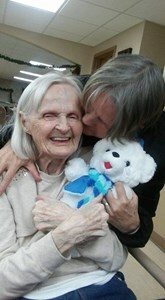 She carried that love with her for many years as she lived in several different states. She was proud to be a military wife and moved quite frequently. She did enjoy traveling and found it to be an honor to married to the military. She enjoyed working with children and became a school teacher. She taught 3rd grade for several years in Nevada and helped many children. They kept in contact with Sylvia for several years even after they were out of school. Sylvia was a born traveler, and had a gift for music. She played both the piano and organ. She loved to read and wrote poetry. She has had several of her poems and stories published through out the years. One of her greatest accomplishments poetry wise is the award where she won 1st place for one of her poems with the American Writers association in New York. She was a member of the Church of Jesus Christ of Latter Day Saints in Junction City. Her and her husband have been cherished members for over 40 years. Most importantly Sylvia was a mother to her Jody. She enjoyed being a mother and then a grandmother and continued to work with children through out her life as she helped in the Nursery at church. Children have always been drawn to Sylvia by her sweet smile and beautiful singing voice. Sylvia married Edward Grimes, with whom she had her only daughter, Joan Lynn Grimes. Edward preceded her in death. She later married Sheridan Collins and settled down to live in Junction City KS. Sheridan preceded her in death on March 19, 1997. Surviving family members include her daughter, Joan Lynn (Grimes) Rogers, Salina; 5 grandchildren; and 9 great grandchildren. She was preceded in death by her parents, as well as her husbands, Edward Grimes and Sheridan Collins, and her only sister, Norma Hodgkins. Funeral service will be held 2:00 p.m., Thursday, January 31, 2019 at the Church of Jesus Christ of Latter Day Saints in Junction City. Burial will follow at Fairview Cemetery, east of Junction City. The family will greet friends at the church prior to the service beginning at 1:00 p.m. on Thursday. The family of Sylvia Collins would like to thank all the staff at Valley View Senor Life for taking wonderful care of their beloved Mother, Grandmother and Great Grandmother for the past 15 years. Memorial contributions my be made to Valley View Senior Life, or Junction City Friends of Animals in Sylvia's name. Johnson Funeral Home in Junction City in charge of arrangements. Add your memories to the guest book of Sylvia Collins. I remember Syliva as one of our frequent customers at our resteraunt the Pizza Palace. Sylvia and her husband Sheridan would order food and had it delivered to their home on Adams street. I delivered food to her home several times and remember how kind and friendly a person that she was. Silvia was the sweetest person, our family came to know her in 1994 when we lived on 12th and Adams and Silvia lived on 16th and Adams, weather permitting Silvia walked daily and she would stop by to chat with my daughter, they had the same love of animals especially dogs to chat about and we came to know her well. We also attended a few of her appearances at poetry events, and were delighted to listen to her recite prose and poetry while sitting on our porch, as well as relating the life she had lived to the fullest. She lived a long full life and was loved by all who came to know her and her love of all things good. He is a God not of the dead, but of the living, for they are all living to him Luke 20:38. I pray for that day when "Thy Kingdom Come On Earth" is accomplished and mankind's paradise home restored under God's rule and the resurrection of all our loved ones sleeping in death. Agap'e. The Hull family, Marva, Melanie, Selina, and Molly.